With all the Christmassey fare I've made over the years, I can't believe I've never made nuts. Until now, that is! 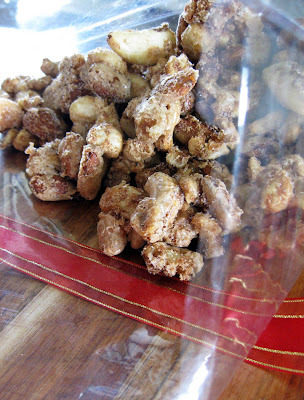 I saw the recipe for these spiced sugared nuts in the December/January edition of Super Food Ideas magazine and knew they would be perfect as a gift. They have a crisp, crackly coating of sugar and spices and the chilli adds just enough heat to cut through the sweetness. These nuts are definitely moreish! Preheat oven to 180 degrees C (350F). Combine the dry ingredients in a bowl. Place the nuts and eggwhite in a large bowl. Stir to combine. Add the spice mixture to the nut mixture and mix well. Line a large baking tray with baking paper. Spread over the nut mixture in a single layer and bake for 10 minutes or until golden. Remove from oven and cool completely on the tray. Break up any large clusters. Serve immediately or wrap in a cellophane bag tied with ribbon for a lovely Christmas gift. I love nuts! How fun to sugar and spice them =D. These look great Susan - very yummy.